Mulligan, Mr. Unknown / Canine / Airedale? Does anybody remember when a bull was called “A rotten old Bovril”? Was Herriot’s successful colleague “Granville,” based on a real character? He loved fine food and drink, and had a wife named Zoe. He could eat and drink so much more than Herriot, but due to his larger size, could consume it without much effect. Herriot could not handle it but felt obliged to keep up with his friend. Not sure what the man’s last name was, though, and don’t remember which book in which he is featured. Loved all the books, read them many times, and watched some of the TV program when I could. Were the sick or dying animals authentic? Everything looked so real. I have known for a long time that the last four series of All Creatures Great and Small were based on original scripts as the BBC had adapted all the books. 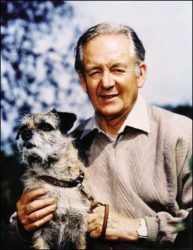 But I remember reading in an old book about British TV that Alf Wight lent the BBC unpublished diaries and that these later series were based on them. I have never read this anywhere else, is there any truth in it? Mrs. Simpson, you refer to Granville & Zoe Bennett. James often took smaller animals to Granville for complex surgery, as his operating theater was state of the art, and seems to me Granville Bennett only ran a ‘small’ animal practice. I think it was called Brawton, where James had to go for Granville’s expertise.